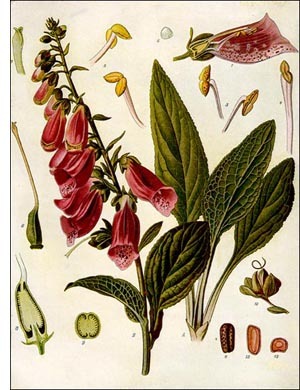 The Foxglove is a biennial herb from two to seven feet in height, with a solitary, sparingly branched stem. The basal leaves are very large and broad, gradually becoming narrower and smaller toward the apex of the stem and its branches, dark green in color, pubescent, margin dentate, venation very prominent. The inflorescence is very characteristic. The large, numerous flowers are closely crowded and pendulous from one side of the arched stalk. The corolla is purple and spotted on the inside. It is a very handsome plant, widely distributed, preferring a sandy or gravelly soil in open woods. When abundant and in full bloom it makes a beautiful exhibit. It is a garden favorite in many lands. Modern physicians consider digitalis one of the most important medicinal plants. It is a very powerful, hence very poisonous drug, its action being due to an active principle known as digitalin. Its principal use is in the treatment of deficient heart action. For medicinal use the leaves from the wild-growing plants are preferred, because they contain more of the active principle. The leaves are collected when about half of the flowers are expanded, and, since it is a biennial, that would be during the second year. The first year leaves are, however, often used or added. Like all valuable drugs, it is often adulterated. The odor of the bruised green leaves is heavy or nauseous, while that of the dried leaves is fragrant, resembling the odor of tea. The taste is quite bitter. Formerly the roots, flowers, and seeds were also used medicinally.